Categories: Alat Survey, Automatic Level. 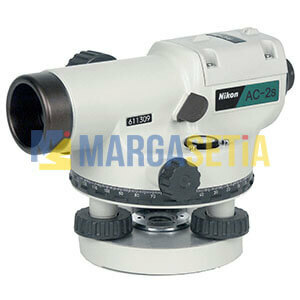 Tags: #margasetia_alat_survey, Jual alat survey, Jual automatic level, Jual theodolite, Jual total station, Jual waterpass. Specifications: Telescope – Magnification: 24x; Objective Lens: 1.2” (30mm); Field of View (at 100): 1°30’; Minimum Focus: 2.46’ (0.75m). Automatic Leveling, Compensator – Compensating Range: ±16’. Accuracy 1km Double Run Level – ±2.0mm. Horizontal Circle – Minimum Division: 1° (1g). Weight – Instrument: 2.8 lbs. ; Case: 2.0 lbs.